As creatures of comfort we try to avoid pain whenever possible—physically and emotionally. Even the most avid adrenaline junkie has soft spots. We cling to what’s secure, safe and feels good in our circumstances and relationships, naturally seeking to protect ourselves. A lot of times, that’s a good thing. We were designed to value life and preserve ourselves. On the other hand if we hold ourselves too tightly, we keep ourselves from following God with our whole hearts. God often asks us to get out of our comfort spots and set ourselves aside for his glory. He wants us to trust him, but we can only do that when we let go and obey. More than likely, Simon had other things to do that day rather than get personally involved in Jesus’ scandalous crucifixion. His own plans and agenda where interrupted when he was given an order to carry the bloody cross for Jesus. It was hard work, bloody, and humiliating, but he carried the cross for Christ and walked with him in his most difficult hours. In doing so, he became part of the greatest story to go down in history. What a powerful example of what Jesus had taught not long before. Even more significant is that what Simon was forced to do, Jesus did willingly. He subjected himself to public mockery, severe beatings, and one of the most horrific deaths the world has ever come up with. As the Son of God, he didn’t have to endure anything; he wasn’t a prisoner of the Roman soldiers any more than he allowed himself to be. 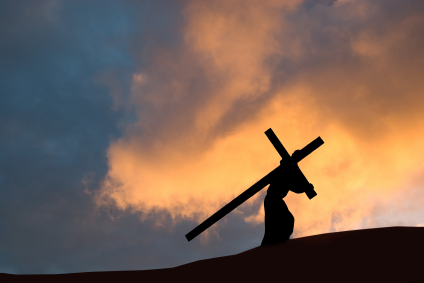 Even in those last excruciating hours nailed to the cross, he could have opted out. But Jesus understood his suffering was not about him; it was the only way to restore sinners like you and me to our loving heavenly Father. God doesn’t force us to follow him either. He doesn’t put the cross on us, but asks us to pick it up willingly. Our decision will cost us something; there’s heavy lifting, rejection, and personal interruptions. Actually, it will cost us everything. The only way to get the life we work so hard to protect is to give it back to God and trust him to take care of it. Do we have it in us to carry the cross with Jesus like Simon did? To publically align ourselves with him no matter what the rest of the world thinks? To get dirty for the sake of the gospel? Do we have it in us to follow Jesus’ example and submit ourselves to God even when it gets tough? Dear Lord, give us the courage, strength, and endurance to follow You every day. No matter how tough the obstacles, how long the dark night, how our plans might be disrupted. In the Name of Jesus, Amen.